Sixteen-year-old Starr Carter leads two lives which couldn't be more different. She goes to a private high school in an affluent, predominantly-white neighbourhood, but she lives in Garden Heights, a poor 'ghetto' neighbourhood where drive-by shootings, gang warfare and drug deals are a common, everyday occurrence. This is an important debut novel which deals with issues of colour, racial stereotypes and a home life that many of us are unfamiliar with. Starr's experiences are powerful and the way that the author conveys them is gut-wrenchingly honest. She allows her characters to speak the way that they would if they were actually in the room with you- leaving in grammatical nuances that are familiar to a black neighbourhood, and contrasting them with the 'posh' voices of Starr's white friends. Thomas’ characters are written in a way true to life, and it's easy to believe that they could be real people. Starr's father Maverick, in particular, is a strongly-written character whose background as a bad guy turned good is inspiring. He has a wicked sense of humour and his courage to stand up for what he believes in, in the face of adversity, sets him out to be one of the most multi-dimensional characters in the book. Starr’s mother Lisa is equally strong. Working in the health care profession, she works tirelessly to give her children the best opportunities in life. The dynamics that the two share in their relationship give Starr and her brothers something to aspire to- creating role models for a better life outside the confines of the ‘ghetto’. Angie Thomas also uses strong descriptive language when it comes to setting the scenes for her characters. Her descriptions of the backlash following Khalil's death are reminiscent of those that we've seen on television far too often, following the death of an unarmed black man at the hands of a trigger-happy white police officer. The subsequent results of this backlash are sensitive and realistic, seen from the perspectives of several people. American rapper Tupac also has a strong influence on a lot of the themes within the story, in particular the title of the novel. The significance of Thug Life (which I was previously unaware of) plays an important role in the novel and in the way that Starr deals with the situations that arise in her life. While she appreciated his work beforehand, Tupac becomes a lot more significant after she realises just how important his lyrics were to Khalil and learns how those same lyrics have been applied to her own life. 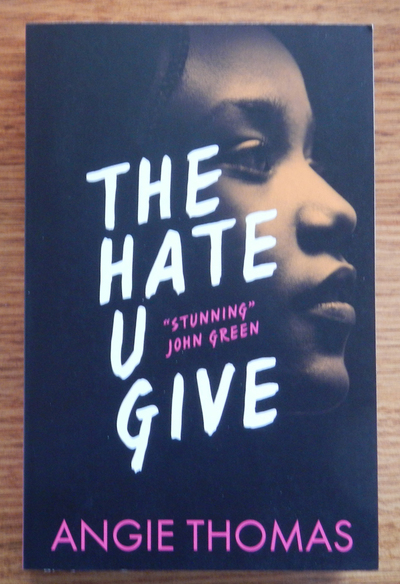 This is a powerful teen novel- one which I think would benefit readers far beyond the confines of its intended audience. Adults, too, could learn a lot from some of the material covered in this novel, which is well-written, important and timely in these days of prejudice. Do You Like Books With Coloured Or Decorated Page Edges?